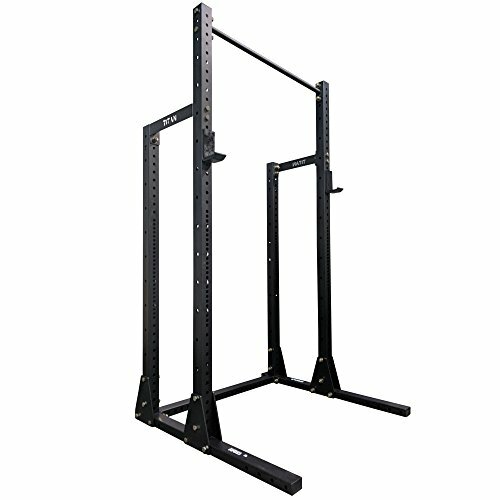 The Titan X-3 Half Rack combines the space saving of a single stack squat stand with the versatility of a power rack. The heavy duty 11 gauge 3"x3" uprights are rated at over 1,000 lbs. The laser cut uprights feature the Westside hole pattern through the bench zone and 2" spaced holes above and below for easy adjustments. The flat foot design stabilizes the squat stand while allowing ample room for your bench. - X-3 3" x 3" 11 gauge steel uprights. - Westside hole pattern through bench zone. - 1,000 + lbs. capacity. - Pair of UHMW lined X-3 J-Hooks included. - Double sided gusset plates. - Front upright height: 92"
- Rear upright height: 72"
Floor Space: 16.3 sq ft (49" x 48") - Rack depth: 17" - Front upright height: 92" - Rear upright height: 72"